IMMEDIATE BENEFITS - Self myofascial release eliminates muscle knots and tension. Trigger point therapy massage lacrosse balls relieve sore and tight muscles to rejuvenate and revitalize all areas of the body. EASY TO USE - Simply lean on the massage ball and use your own body weight and gravity to relieve muscle knots and tension. MASSAGE ANYWHERE - Perfect for use while sitting on any chair, laying in bed, on the floor, or on a yoga mat. Use them at home, at the office, or at the gym. Small, portable and easy to bring along on any trip. DURABLE - 100% Solid Rubber Construction. Official size and weight meets NCAA specs and NOCSAE standards. Also great for lacrosse practice. 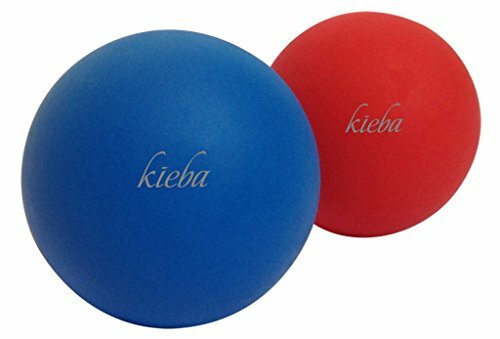 100% MONEY BACK GUARANTEE - If you are not 100% satisfied with your purchase of the Kieba Premium Massage Balls, simply return them within 30 days for a no-questions-asked full refund! Buy with confidence!